Sometimes I think we are not too good children. Since my mom is in hospital we go visit her sometimes quite late because of the traffic and work. A few times my cousins who are visiting her had to call us to find out where we are. Then some of them ask us who stay with her over night and we said No one. hehe... well my mom always ask her to go home. Also there is nothing much we can do at this stage because she just lie in the bed. Then yesterday before her surgery my sister and I were with her. Then they wheel her down for surgery ... we saw her to the door and then the nurse say that as far as you can go. Then my sister look at each other... what to do.No bed to sleep on upstairs so we went out. Went to Bangsar Shopping Center and ate dinner. So while mom was having surgery we were shopping. But no mood also just walk ard to kill time and not worry abt her too much. Dr called abt 7 pm to say the surgery went well and she should be back in her room at 8. Lucky we managed to go back to the room before she came back up from surgery. But mom got her revenge on us. Because mom was not under GA she was semi awake during the surgery. We ask her what did u think about during the surgery ? her answer was JAKE !!!!! we ask her u mean you didn't think about us. then she thought very long only answer a bit. But i think she said that not to hurt our feeling. Mum is schedule for surgery on Thursday at 3:30 pm. hehe.. pls dont ask me the details coz I also don't really know. Something about replacing the head and putting cement. The important thing to know is that in 2 days she can sit up and 3 days she can actually walk again with the help of the walker. Currently she is just lying in bed in Pantai. Enjoying the astro. Last night she has an extra person trying to squeeze in the bed with her. Sorry don't know how to turn picture. There must be something about year end that make me spent late night at hospital emergency room. This time it is my mother. Around this time last year it was my father. Although the journey to the emergency room was not as bad and scary as my father was. 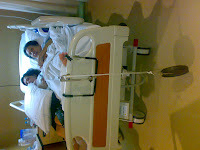 (My father last year collapse in the house and had to send him by ambulance to the hospital). My mother result is more serious than my father. It started from her fall on monday.. well sat the pain was still there we sent her to the Chinese doc and after that she say she felt a bit better. Sunday went to my cousin place for dinner and when we came back around 8 something we were all getting ready for bed. My mom was downstairs (since she is sleeping downstairs since the fall) she suddenly yell for me to come down. I thought she wanted something.. when i reach downstairs I saw that she was on her knees. She said she try to stand but her left leg suddenly went weak and cant support her. So I yell for my sister and both of us try to help her up. (btw.. the dog was protecting her as usual... funny story later). She was in quite a lot of pain. My Dad said to send her to Pantai emergency since we were going to bring her for her check up on sat anyway. Between my sister and I we managed to get her to the car and it took us sometime. Anyway they did xray and stuff and found that she has a fracture in her hip joint. So they have to do surgery to insert a rod and something... The surgery is not that dangerous but it is the after care. I guess we have no choice but to do the surgery. For those of you who have elderly parents my advice to you if they fall and dont recover within a few days or hours best that you send them for xray. Best if you can help it make sure they don't fall. If I can say something to the older folks it would be dont be so stubborn and think that you are super being. Have broken things are very hard to fix and worrying. 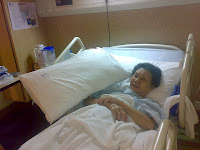 Please do not tell my mom that we are worried about the surgery and recovery. Now we are telling it is a small thing and that she will be OK and there is nothing for her to worry about.